Hat with ear flaps: age 4yrs to women 50g, men 100g. Hat with ear flaps and pompom : 4-6yrs 50g, 7yrs to women 100g. 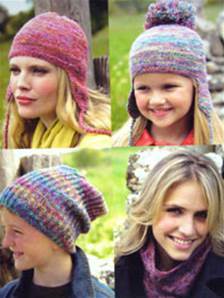 Ribbed hat: 4-6yrs 50g, 7yrs to adult men: 100g. Neck warmer ( 1 size) 100g. Based on 50g balls acrylic/ wool blend. 22st/ 28 rows to 10cm, 4mm needles. 4mm needles. 3.25mm needles (except ribbed hat). 2 st holders for hats with ear flaps.